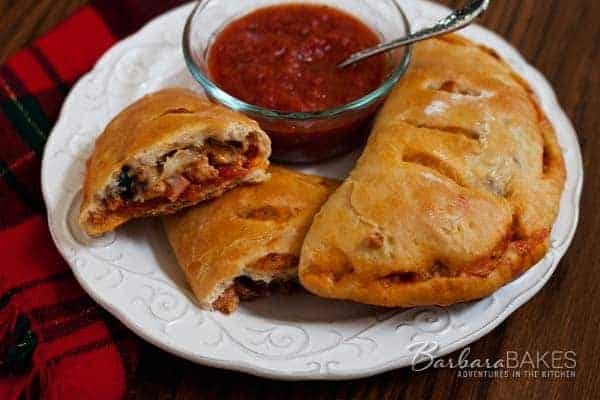 These Meat Lovers Calzones are stuffed with pepperoni, sausage and Canadian bacon. This easy calzone recipe is for all you meat lovers. Calzone, which means “stuffed pants” in Italian, is like a little pizza sandwich. Calzone fillings vary, but generally, they are filled with common pizza toppings. I love baking breads, so when Red Star Yeast asked me to team up again this fall to post three more yeast bread recipes, I jumped at the chance. Red Star is updating the recipe section of their website with photos of their delicious recipes, so they’ve teamed up with food bloggers who will make, photograph and blog about the chosen recipe. My first pick is their easy-to-make meat lovers calzone recipe. The Calzone dough recipe comes together quickly, then after about an hour rise, it’s ready to shape into meat lovers calzones. 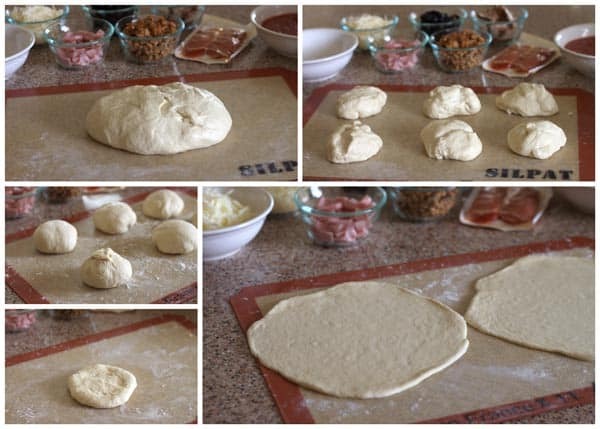 The dough is easier to roll out in to a circle if you shape it in to a ball first. Just pull the ends to the bottom to create a smooth round ball. I like to use my fingers to pat the dough in to a circle. When I’ve shaped it in to a circle, then I’ll pull out the rolling pin and roll it a bit thinner. I like to work with two circles at a time, so I let one rest and the gluten relaxes while I’m patting out the second one. Then I’ll come back to the first one, and after that little rest, the dough is easier to work with and stretches much easier. My family loves making Calzones for dinner. I put the fillings out and everyone makes their Calzone just the way they like it. I give them a ball of dough and they create their masterpiece. There’s often bragging and teasing about whose Calzone looks the best. The original Calzone recipe on the Red Star website is a veggie Calzone, so feel free to substitute your favorite pizza toppings. You can use store bought pizza sauce, but I used my favorite, easy-to-make homemade pizza sauce. You’ll want plenty of sauce so you can also serve some on the side for dipping. 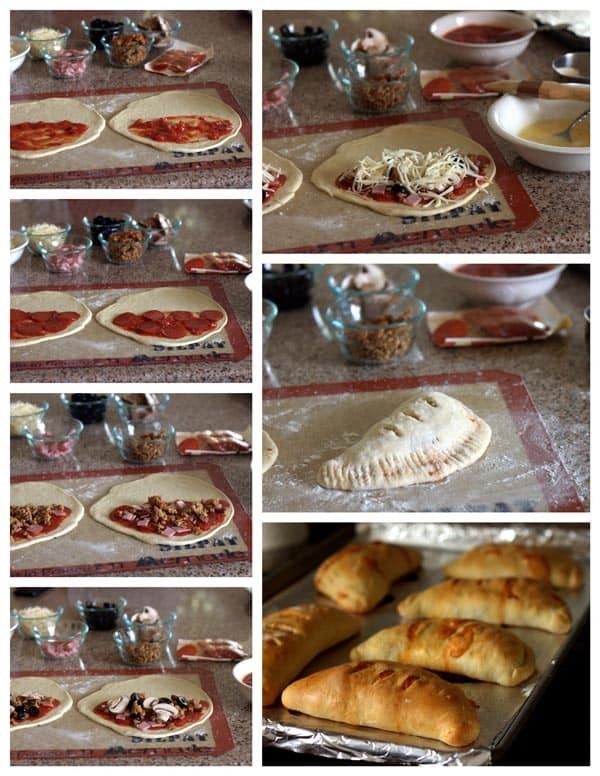 Calzones are a fun alternative to pizza and a great way to get your family in to the kitchen and baking with you. Combine flour, salt and yeast in a large mixing bowl. Add liquid ingredients and mix with paddle or beaters for 4 minutes on medium speed. Gradually add additional flour if needed and knead with dough hook(s) 5 to 7 minutes until smooth and elastic. Place dough in lightly oiled bowl and turn to grease top. Cover; let rise until dough doubles and passes the ripe test. Preheat oven to 375°. Turn dough onto lightly floured surface; punch down to remove air bubbles. Divide dough into 6 pieces. Shape to balls. Let dough relax 10 minutes. On floured surface, roll each piece into an 8-inch circle. Spoon pizza sauce, cheese and toppings onto half of each circle. Moisten edge of dough with mixture of 1 egg and 1 teaspoon water. Fold in half; seal edge by pressing with fork. Prick each top; brush with remaining egg mixture. Bake on greased cookie sheets for 30 to 35 minutes or until golden brown. Serve immediately. This recipe is perfect. First time making Calzones and they turned out exactly as pictured. Thank you for sharing this recipe. Thanks Sherry – glad you loved them. is the water heated to celcius or farenheit? Fahrenheit always on my site. Enjoy! This isn’t a Calzone, it’s a Stromboli, Calzones do not have any sauce inside, you dip them in the sauce. Kenneth is correct and you are wrong actually. The main difference between a Calzone and Stromboli is that a Calzone is served with sauce on the side and Stromboli has sauce in it. Please Google it if you really still think you’re right. Come guys – it doesn’t really matter want you call it, as long as it’s delicious, which it is. Can you use regular flour?! When I first started making calzoni, I had difficulty keeping them from opening up in the oven. Do you think the egg helps with that? Hi Richard – Yes, the egg helps and not over flouring your rolling surface, and making sure you haven’t add too much flour to your dough so it’s not too dry. Such a lovely calzones! It’s really mouthwatering and it definitely looks perfect! Looks delish! The bottom of your calzone looks crispy mine are soggy. Any tips to make the bottom crispy and not soggy? Thanks Kim! Make sure your pizza stone is preheated for at least 30 minutes before you start cooking. Don’t put wet fillings inside, use too much sauce or too much cheese. Enjoy! Che bella idea!!!! Io questa sera preparo la pizza per i miei ometti!!! I’ve been on a bread baking binge, now that I’m back in the kitchen. I’ve had calzones on the brain. I’ve never made them, but I love sausage and onion. I also love Red Star. Thanks for the great post. Bring it on! Need to try these on a football Sunday 🙂 They def will be a hit! BigBear would LOVE these! He always gets calzones when we go to a pizza place…ok well MOST of the time! 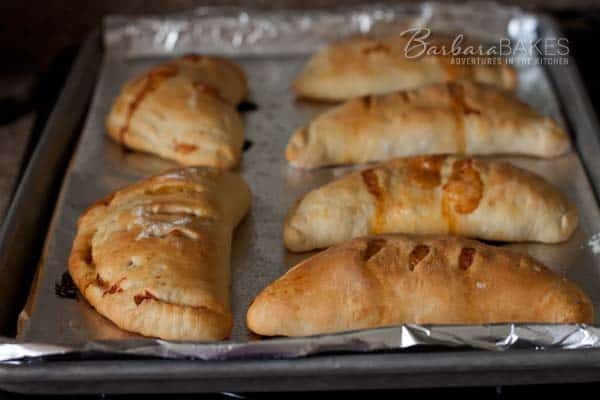 I’ve never made calzones – these look so good!! My men would go wild for these! And I love working with this kind of dough! Fabulous! I had to share this on my Life’s a Feast page…. just delicious!